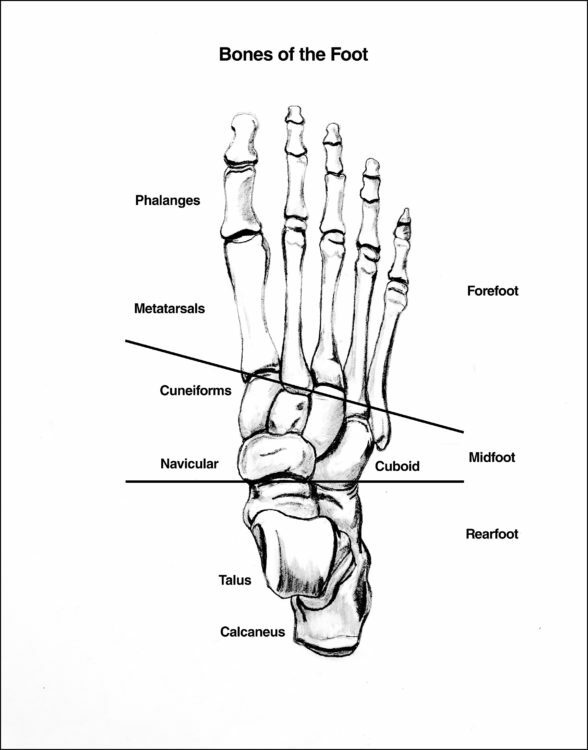 Insight: Do you check the range of motion of the great toe and metatarsals of your clients? This is often overlooked and has great implications for biomechanical compensations. You will often see tight hip flexors, patellar tendon issues, or lack of transverse-plane motion when the great toe and metatarsal heads are tight or limited in motion. Many trainers believe they do not need to know what the foot does, and most of the programming they do is from the calf up. 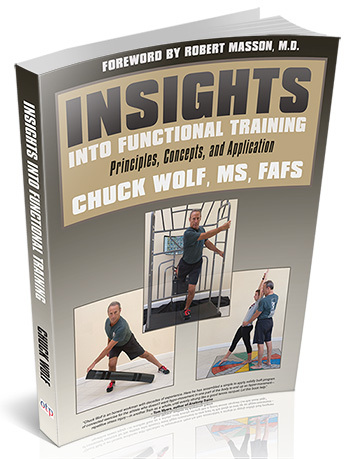 However, as you study this material, you are gaining increased appreciation of human movement, and hopefully a greater interest in foot function. There are 33 joints, 24 muscles, and 26 bones in the foot, which is the conduit that interfaces with the ground and sets the platform for the body to react. There are considerable reactions that take place during normal foot reaction and through the gait cycle. The discussion in this section will assume “normal” foot function, with no pathology that may present in those afflicted with a foot disorder. With the numerous reactions that occur in the foot during the gait cycle, there are four essential actions we need to observe in foot action. The foot is categorized into three regions, the forefoot, midfoot, and rearfoot. The forefoot consists of the toes—the phalanges. 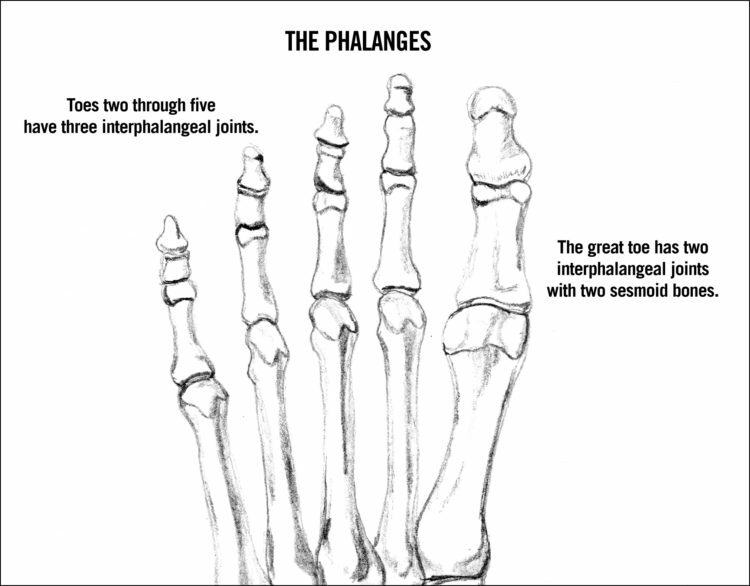 Phalanges two through five have three bones and two joints, while the great toe has two bones and one joint. The midfoot includes the three cuneiforms—medial, intermediate, and lateral—the navicular on the medial column, and the cuboid on the lateral column. These five bones form the midfoot arch and must be mobile to absorb forces during the “collapsing” of the arch in pronation. 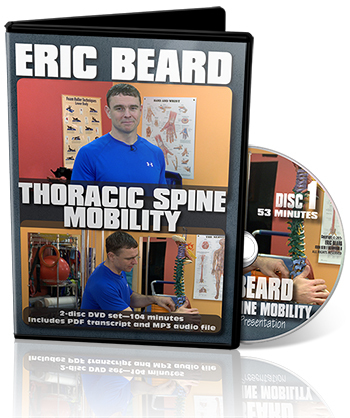 Additionally, these structures must adapt and “lock up” as the foot moves through inversion or supination. This allows a rigid lever to propel the foot forward during the heel-off through toe-off phases of gait. The calcaneus and talus make up the rearfoot. The calcaneus has a concave surface on the superior aspect, and the talus is convex at the inferior surface. The union of the calcaneus and talus form the subtalar joint, an extremely important joint that sets the environment for successful tri-plane motion. 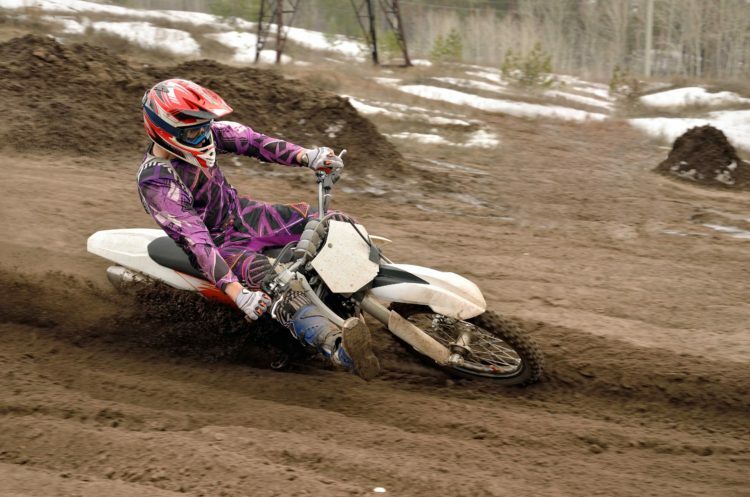 When describing the action of the rearfoot, think of a motorcycle rider. Imagine the rider starting to lose balance; the bike falls to the right while the tires turn outward. In our analogy, the tires and bike are the calcaneus, while the rider is the talus. The rider—the talus—wears a long helmet called the tibia; the tibia sits atop the talus. The bottom of the tires turn left or outward, similar to the left calcaneus when everting. As the bike “falls” to the right, the tires turn outward, similar to the left foot hitting the ground and causing the calcaneus to evert—the heel “falls” right, while the bottom of the heel turns outward. With the foot on the ground during the landing phase of gait, the medial column of the foot, composed of the union of the talus and navicular forming the talo-navicular joint, fall medially toward the ground. Based on the axis of motion, the primary motions of the talo-navicular and subtalar joints are eversion and inversion in the frontal plane. 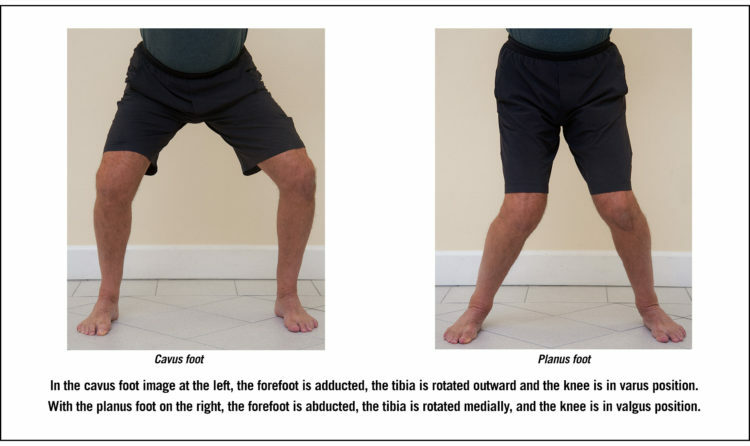 This motion allows the tibia to move farther forward in the sagittal plane and to dorsiflex at the ankle, while also internally rotating in the transverse plane. Most texts discuss the sagittal plane of the ankle. In isolation, the talocrural joint—the ankle—is strictly a sagittal-plane mover. However, when the foot loads as it hits the ground, the ankle dorsiflexes in the sagittal plane; the calcaneus everts, causing the subtalar joint to evert in the frontal plane, and the tibia internally rotates in the transverse plane. This reaction in turn causes the midfoot to evert in the frontal plane. The forefoot abducts in relation to the mid- and rearfoot due to the motion of the distal bone in relation to the proximal bone segments. Because the rearfoot and midfoot move farther and faster than the forefoot in the frontal plane, the metatarsals and phalanges are lateral to the proximal segments. Therefore, they are abducted to the rearfoot. In cases where the mid-tarsal joints are limited in motion, the ability to pronate—or unlock and unload—is compromised. This does not allow the rearfoot to pronate or the tibia to internally rotate. If this occurs, the knee will not efficiently flex, abduct, or medially rotate. Here the lower extremity is in a relatively extended position that is not optimal to load and propel. This often results in patellar tendonitis, hip pain, and low-back problems. The tissues remain in a shortened, propelled state, not allowing the lengthening of tissue associated with the pronation phase. This lack of preloading results in overuse of tissue during the propulsion phase of gait. Additionally, these same maladies are common when the great toe is limited in its ability to dorsiflex. This benign yet important action allows the knee and hip to extend to an optimal length, causing adequate preload of those tissues. Equally important, this action serves as the last required impetus to shift weight to the opposite leg and hip, leading to optimal hip adduction on the opposite side. When transforming into the weight shift to the other side, the hip adducts and internally rotates, raising the hip and allowing the swing leg clearance above the ground. Without this, the knee of the swing leg must compensate with prolonged knee and hip flexion to clear the foot prior to heel strike. Over time, this can lead to an overuse injury, often at the patellar tendon or hip flexors. These motions clearly show the foot and ankle complex moving in three planes of motion. We want mobility in the foot during the pronation phase, yet as ambulation takes place and the hip moves over the foot, the swing leg drives the opposing hip forward, which will invert the calcaneus, plantar flex the ankle, externally rotate the tibia, and adduct the forefoot.